Audrey's parents and her brother are living in New Concord Village, Union Twp., Muskingum Co., OH (p. 260A), but Audry isn't with them. 2. 1900 U.S. Census Every-Name-Index/Images (online at Ancestry.com): James YOUNG (æ 20, b. Nov 1879, OH) and his wife, Martha G. (æ 17, b. Dec 1882, OH), married less than a year, are living in Highland Twp., Muskingum Co., OH (p. 96B). 3. 1910 U.S. Census Every-Name-Index/Images (online at Ancestry.com): George A. DAVIS (æ 3, b. PA) is living in Vandergrift, Westmoreland Co., PA, with his parents (q.v.). Audrey L. YOUNG (æ 4, b. OH) is living in Highland Twp., Muskingum Co., OH (p. 96A), with her parents, James A. YOUNG (æ 30, b. OH) & M. Grace (æ 27, b. OH), plus an older brother. 4. 1920 U.S. Census Every-Name-Index/Images (online at Ancestry.com): George A. DAVIS (æ 13, b. PA) is living in New Philadelphia, Tuscarawas Co., OH, with his parents (q.v.) Audrey Y. 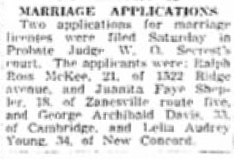 YOUNG (æ 14, b. OH) is lving in Union Twp., Muskingum Co., OH (p. 273A), with her parents, James A. YOUNG (æ 40, b. OH) & Martha G. (æ 31, b. OH), plus an older brother. 5. 1930 U.S. Census Every-Name-Index/Images (online at Ancestry.com): George A. DAVIS (æ 23, b. PA) is enumerated with his parents in New Philadelphia, Tuscarawas Co., OH (q.v.). Can't find Audrey. Her parents and older brother are in Union Twp., Muskingum Co., OH (p. 260A), but she is not with them. 1940: for an explanation of the column headings, please see What the Numbers in the Federal Census Mean. Are the records for 1945-1957 lost or just not indexed? It might be worth checking the county records for his death certificate. 10. WorldConnect / Ancestry World Trees (online at RootsWeb.com/Ancestry.com): Audrey only, as of 1 Jul 2015.